More events/sessions may be added as interest allows. ALL PRACTICES RUN RAIN or SHINE except during Lightning conditions. Monday evenings- Advanced Dock Diving – Drop in and get instruction for Air Retrieve, Hydro Dash, High Jump, or Distance. $20 per dog. Thursday evenings – Beginner Dock Diving Lessons. Click HERE for event details, rules, and entry forms. 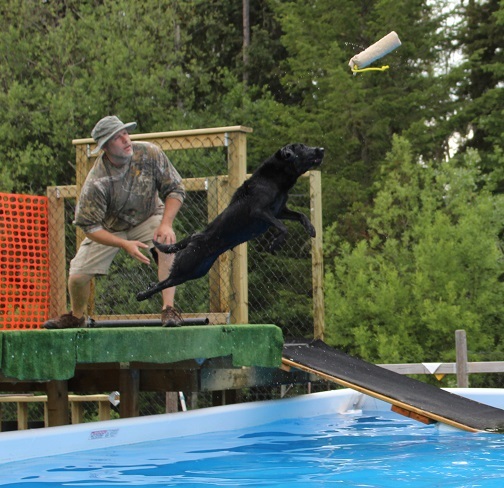 Compete to earn personal bests, ribbons and titles (recognizable by the Canadian and American Kennel Clubs) or to qualify for the national championships! Open Dock Practice- runs each Wednesday once the pool has opened. There is no instruction during this time so come with your own training plan, though there is a pool attendant to assist as requested for holding dogs or equipment setup, etc. NOTE– dogs MUST have had at least an introductory lesson or seminar before they can participate (this is not learn-to-swim time, it is for practicing dock diving only). Each dog cycles through their turn doing 3-4 jumps per turn (maximum 2 minutes), with practice starting at 6 pm and cycling through until dark or everyone has had enough. Cost is $15 for the first dog ($10 per additional dog owned by the same family) or purchase a 10 pack punch card for $120+tax. The agility field is open to use and included with your dock fee on Wednesday evenings. Agility Open Practice– Friday evenings from 6-8 pm. This is for dogs who have had some agility instruction. This is a drop in style practice, $10 per handler (handlers with multiple dogs are welcome. 3 minute training turns will go in rotation by handler). A course will be set but handlers will be able to adjust heights or configuration for specific training goals. Handlers are expected to help set courses/change bar heights when their dog is not running. Dogs entering the pool need to have appropriately trimmed nails for their own safety, and for the protection of the dock and pool. Please also ensure your dog is not shedding profusely to prevent clogging filters with dog hair. Forcing your dog into the pool is prohibited. Dogs must willingly enter the pool on their own. No pushing allowed! No food treats in the pool. Dogs must be kept on leash except when on the dock and in the pool. Safety is our top priority- many dogs who compete in dock diving are not dog friendly!!! Dog to dog contact is not permitted in the pool area. This is a high adrenaline sport so at least 2 leash lengths away from any other dogs is advised for safety. Please also keep your dog away from the pool while observing so as not to be a disruption to the working dog. Please prevent your dog from marking on the pool or on any part of the dock. Pottying in the agility field is also prohibited. a crate for your dog for between turns, shade if required depending on weather. a standard leash no more than 4-6 feet long (no flexi leashes) and a flat buckle collar. Ecollars, prong collars, and head halters are not allowed on the dock or in the pool. A change of clothes (at the very least your dog will shake on you) and either a change of shoes or water resistent foot wear. Dock diving season pass card or session/drop in fees in cash. Your own creature comforts- sunscreen, bugspray, drinking water etc. PLEASE NOTE – the pool and dock are located on private property. Please drive SLOWLY when you enter the drive and be watchful for pets and people. Proceed THROUGH the yard to the field where the pool is located. Please don’t let your dog out of the vehicle until you’ve parked near the pool. On your first visit, we’ll be happy to show you where to park, where you can warm up your dog, allowable areas to potty, and so on.